Our Biddie Buddies Ferret Snuggle Sacks feature a hammock-style design that ferrets can lounge on top of, or snuggle into. 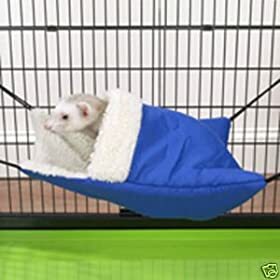 Padded sack with berber lining is a cozy spot for ferrets Can be used as a hammock, or ferrets can snuggle inside Attaches securely to wire cages with four metal clips. These are great for pet rats too!